You are here: Home / News & Updates / Annual Meeting 2019! 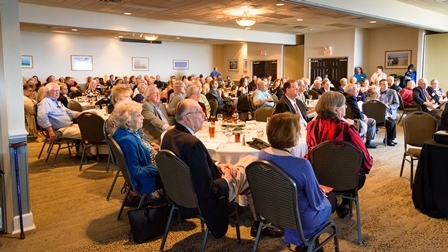 We hope you will join us for the Annual Meeting of the Outer Banks Community Foundation! The luncheon will be held on Tuesday, February 19 at the Ramada Plaza Hotel at 1701 South Virginia Dare Trail in Kill Devil Hills. We invite you to arrive at 11:30 am to enjoy socializing while browsing some local history exhibits from our 2018 grantees. A delicious lunch will be served at noon, after which we will conduct some brief membership business (including ratification of new proposed bylaws), watch the winning videos from our annual video contest, and announce our 2019 Champion Award. We are near the maximum for the seating limit at our Annual Meeting. Please call 252-261-8839 to register, and we will do our best to accommodate you or, if need be, add you to our wait list. Thank you so much for your interest! Photograph above by Biff Jennings, Shooters at the Beach. https://www.obcf.org/wp-content/uploads/2019/01/DSC9888-smaller-group-shot.jpg 252 448 OBCF https://www.obcf.org/wp-content/uploads/2013/07/obcf-logo.png OBCF2019-01-14 10:56:182019-02-11 10:41:40Annual Meeting 2019!